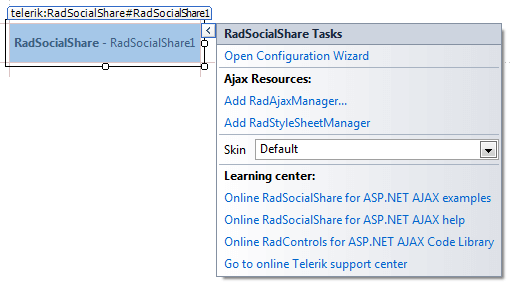 The Smart Tag of RadSocialShare lets you easily select the available buttons, change the skin for your control or quickly get help. You can display the Smart Tag by right clicking on a RadSocialShare control and choosing "Show Smart Tag", or by clicking the small rightward-pointing arrow located in the upper right corner of the control. The built-in visual designer allows you to easily add the buttons you wish to the RadSocialShare control and it will create the needed markup for you. The left column lets you choose which of the Button Collections you will modify. By default the MainButtons collection is selected. In the middle pane you see a list with the already added buttons and the name corresponds to the type of the button - the SocialNetType property for the Styled Buttons and the name for the Standard Buttons. You can add a Styled Button by pressing the first button, the next three are respectively the Standard Buttons for Facebook, Twitter and GooglePlusOne. The fifth button adds the RadCompactButton and the sixth removes the selected RadSocialButton. You can choose which network the button connects to by directly typing the Standard Buttons's name (or SocialNetType property for the Styled Button) in the list, or you can select this from the dropdown in the right pane where you can choose all other options. If you type in a name that does not exist as a possible value for these properties the input will not be taken and the button will be reset to its previous state. Note that the names are case-sensitive. By default the GoogleBookmarks Styled Button is added as it is the first one in the alphabetical order. If the button type is changed via the properties pane this change is automatically reflected in its name in the list and vice versa. You can reorder the buttons in the collection by using the two arrows on the right of the list - each click moves the selected button one position up or down the list. All other properties can be controlled via the right pane which is the standard Properties pane of the Visual Studio. By default only the SocialNetType and the ToolTip are set for each Styled Button and are rendered in the markup. 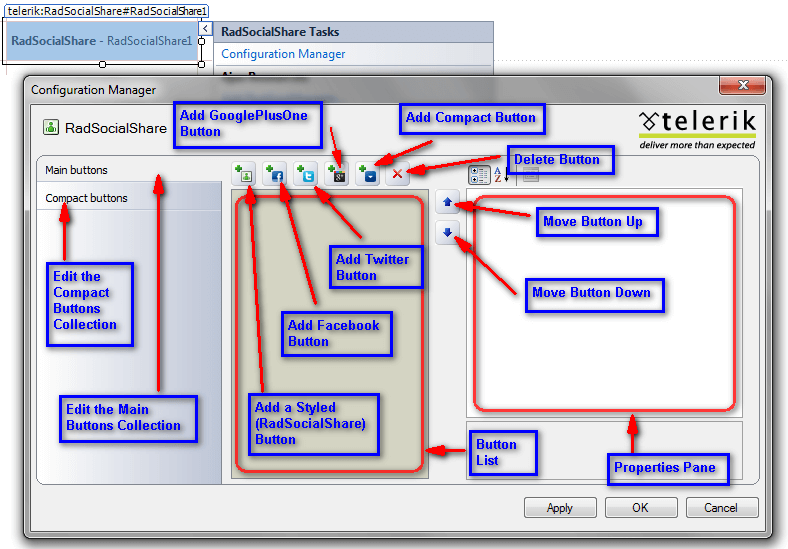 For the Facebook Standard Button only the ButtonType property is selected by default and the Twitter and GooglePlusOne buttons do not need any additional properties initially. You can leave this as-is, or modify the properties as needed. When working with the CompactButtons collection you can only choose from the Styled Button as they are the only ones that are acceptable for it. Therefore if a name for a Standard Button is entered it will not be taken by the Configurator. The Skin drop-down displays a list of available built-in skins that you can apply, along with an example of what the control will look like for each skin. Assign a skin by selecting from the list.